A church has made history with the premiering of ‘adolescence rites’, a standard ceremony to start girls into womanhood. 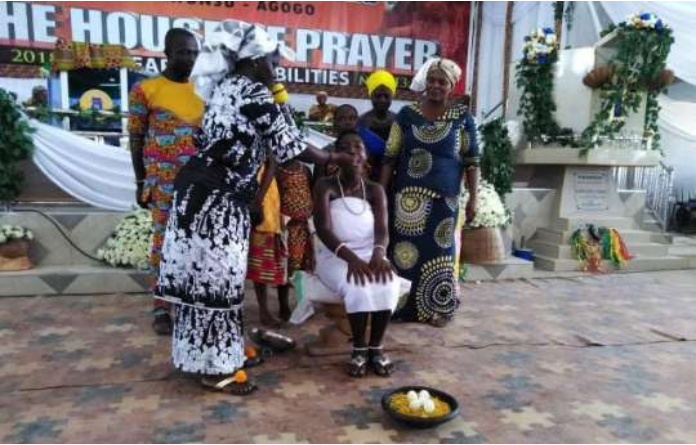 Ms Portia Owusu, a 16-year old member of the Methodist Church Ghana (MCG), in the Atonsu-Agogo branch in Kumasi, was the very first maiden to be started under the guidance of the Really Rev. Solomon Bruce, Minister in-charge of the branch. He was assisted by some traditional authorities for the success of the programme, aimed at giving the opportunity to the maidens in the church to cherish their V!rg!n!ty and also lead m0rally-upright lives. The well-attended ceremony, interspersed with traditional drumming and other customary rites, as part of measures to revive African consciousness within the church. Dubbed “2018 Traditional Day”, the programme saw the young girl, clad in a white cloth (tied around the chest down to the knee) and decked with some traditional beads being unveiled to the church, after undergoing the ceremonial rites. As part of the rites, the young lady being initiated was also made to eat a special traditional meal (mashed ripe plantain and some hard boiled) eggs. Very Rev. Bruce, speaking to the Ghana News Agency (GNA) on the sideline of the programme, said it was the first of such cultural events to be openly held in the church. The new move is widely seen as an aberration of a debatable perception that customs and traditions should not part of Christian worship, but Very Rev Bruce thinks otherwise. “The Methodist Church sees nothing wrong with the African culture,” he said and affirmed the leadership’s resolve to integrate acceptable traditional norms and values into the church’s activities. “We are born into a society which has its own culture. The church is, therefore, happy to bring back our heritage to help members identify with Methodism”. Very Rev. Bruce took a swipe at those who considered African traditional beliefs and practices as being fetish, saying this must stop.